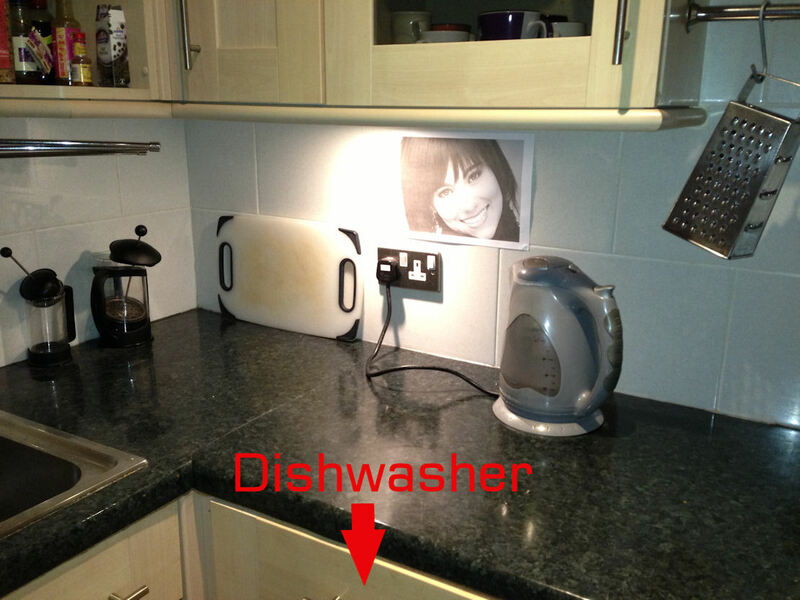 You might like to know the results of a social experiment I conducted using my flatmates … without their knowledge. It will not surprise you to discover that this experiment was not carried out using the highest levels of scientific standards. Even the hypothesis being tested is also somewhat questionable, but hey, sometimes fun is more important than science. Okay, so here’s what happened … someone told me that if you put up a photo of a happy smiling face, it makes people more honest and considerate (e.g. 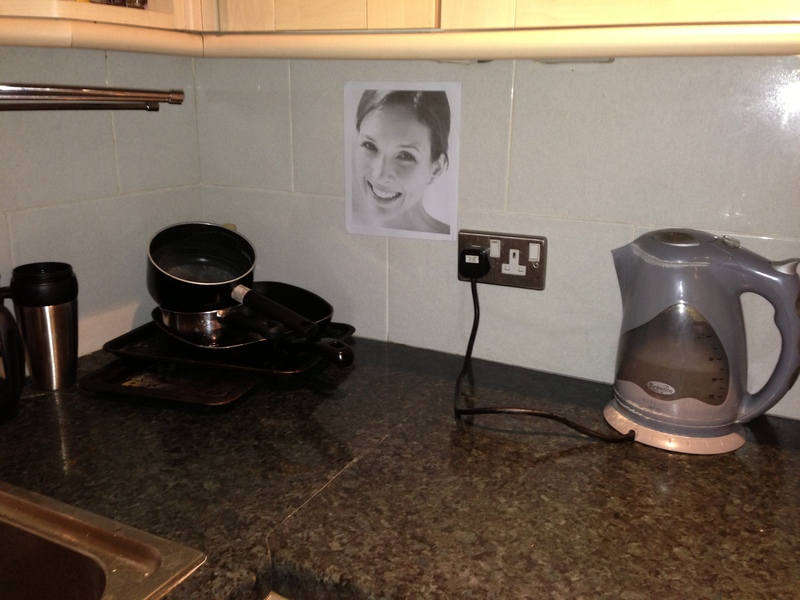 at work, if you put a smiling photo near the office kettle, the amount of money in the honesty pot for tea & coffee goes up). Apparently there are studies to support this, but I have not found anything online to back this up (if you know anything about whether there is any truth in this or not, please let me know). Anyway, I thought this might “the solution” to the dishwasher issues with my flatmates. Regulars of this blog will already be aware of the difficulties I have had with my flatmates who seem to not know how to use a dishwasher and think it is full of little cleaning pixies who will sort out whatever you put in, no matter how you put it in. I’m not some sort of dishwashing Nazi, but think it is nice to have clean plates, mugs and cutlery. I even wrote an email from the dishwasher (called Glen), pleading with them to help him do a better job. Yeah, yeah, whatever, you must know by now I’m slightly odd. It was quite funny as when I put the photo up I suddenly realised that I had not thought of a reasonable excuse as to why I had put it up? I couldn’t say the truth as it would void the results of the experiment. The first night it was up, none of the other flatmates (there are 3 of them, two girls and a Neil) noticed. Then, the next morning … I heard whispering, one of them had spotted it, they then told the other and then the other. I was ready to answer questions, but no one said anything to me about it?! Perhaps it was the photo I chose? So, for Week 2 I put up a different photo to see if that might have a different impact? The photo did seem to have a different effect. It seemed to make the situation worse! With even poorer use of the dishwasher and big build up of dirty pans and plates above it, the kitchen was a bit of a mess. Still no one asked me about the photos?! I took down the photo and things seemed to improve back to the way they were. This entry was posted on Sunday, November 18th, 2012 at 3:40 pm	and tagged with conscientious, dishwasher, dishwashing, Experiment, flatmates, honest, Smile, smiling, smiling face, social etiquette and posted in etiquette. You can follow any responses to this entry through the RSS 2.0 feed.